На странице представлен выбранный Вами товар Christmas~Primitive~Gingerbread Man~Grungy~Linen Cardstock~Gift~Hang~Tags~Ornies. Offered today is a brand new set of (6) Primitive Gingerbread Man gift tags precision hand cut into Gingerbread man shapes. to assure good sturdy tags and are printed with professional grade premium pigment based inks for great clarity and crisp color. The edges of the tags have been carefully hand inked giving them a unique appearance. tied to a package or goody bag, or anywhere you need a Prim Ginger decoration. Each tag is hand cut, hole punched and finished off with a generous length (12 inches) of grungy baker’s twine string ties. Every handmade tag comes from my smoke free and pet free work studio. I create with love and ship with care. 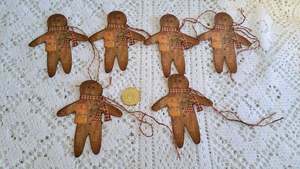 Please note.... You are bidding on a set of (6) Primitive Gingerbread Man gift hang tags... the same ones described and are displayed in the photo(s). Other items shown in the photo(s) are for comparison and display purposes only and not included in the listing. Thank You for taking time out to look through my store... I appreciate your kindness. Do stop by again as I often add new and interesting items. If you have questions, please email me prior to bidding. ***Items are shipped out the same day or the next day (depending on time of order placement and postal hours) and are bubble packaged with a USPS Tracking Number included. I try my best to describe items listed as best as possible. Item quality will be stated honestly and as accruately as possible. smoke and pet free home. Positive feedback will be left upon payment received. All folks who wish to bid on items and not pay accordingly will be reported as such. Payment Is Thru PayPal ONLY! Payment Is Due Within 3 Days Of Auction Closing. If you plan to pay with Paypal e-check, your item(s) will be shipped out after confirmation of payment is posted. it is for US shipping only and international shipping charges will apply accordingly. If purchasing multiple items within the same day, if applicable, I will combine items and reduce shipping charges. A credit will be issued to your PayPal account as specified. I ship in the USA and international to verified PayPal addresses only! International Shipping Customs Examinations can impose an additional fee on the buyer for whatever reason they choose. duties fees that Customs Examinations imposes. In case there's an inspection by the local customs or post service, delivery will be effected accordingly. Seller reserves the right to cancel auction in case of error or malfunction. If you are not happy with your purchase,I will credit the auction price paid, within 3 days of auction. Please contact me by email as soon as discrepency is noted. if any, intact. No Exception!